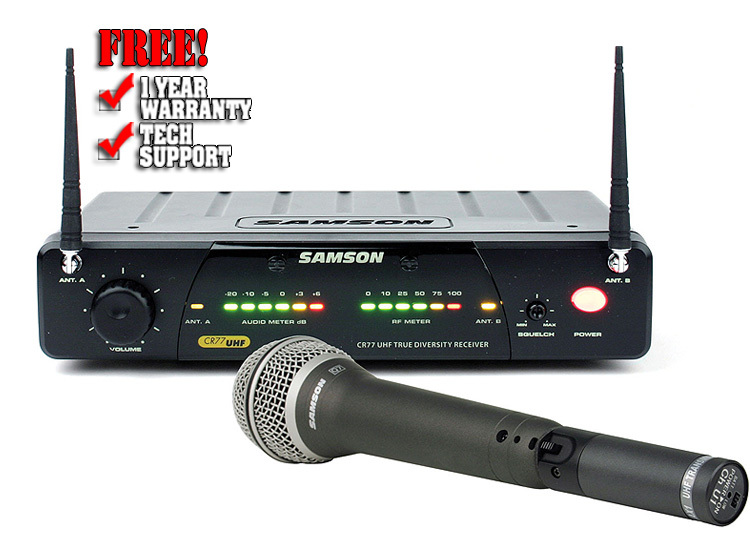 Samson is the value leader in wireless microphone systems, and they've done it again! The Airline 77 Series offers solutions for any wireless demand, from guitar/bass systems to handheld microphones. The SW7ASHX handheld mic/transmitter gives you a quality Samson mic capsule mated to the AX1 handheld transmitter and a CR77 true diversity receiver. The Airline 77 Series handheld system starts off with the Q7 mic element, the finest neodymium handheld dynamic microphone Samson makes. The Q7 is a great all-around microphone, excelling not just on vocals but also as a stand-mounted mic for acoustic guitars and other instruments. Its high-output, low-impedance design provides plenty of gain to cut through a mix, and the supercardioid pickup pattern rejects noise from stage instruments. The Q7 also features a shockmounted element to reduce handling noise and stand up to tough onstage use. The Airline 77 handheld mic system employs the AX1 UHF transmitter. The AX1 is powerful and reliable, with an integral 1/4-wave antenna. Combined with the Q7 mic element, it provides the ideal vocal mic solution for your gig. The Airline 77 Series' CR77 wireless receiver gives you the dropout-free reassurance of a true diversity system. The CR77 constantly polls its two receivers and locks into the strongest signal. It's available with any one of six UHF frequencies. The CR77 is rugged, durable, and crystal clear, with an impressive range. It brings you sophisticated wireless technology at a great price. The entire line of Samson Airline wireless systems deliver pro-quality UHF wireless that any group can afford!